A pair of experimental U.S. missile defense satellites has passed aseries of vital tests in space, spotting three missile launches andsuccessfully relaying data about their trajectories to observers on Earth. The two satellites make up the SpaceTracking and Surveillance System (STSS) and were built by Northrop Grummanand Raytheon for the U.S. Missile Defense Agency as a demonstration oftechnology to protect the United States from enemy missiles. The $1.5 billion STSS Demonstration missionwas launched in September 2009. The STSS's most recent test, the June 28 observation U.S.Missile Defense Agency rocket launch during anintercept test, was "the most thorough indication yet of the space-basedsensor's capabilities," Northrop Grumman officials said in a statement. The STSS satellites are designed to pave the way for a futureconstellation of missiledefense satellites. Each of the two satellites is equipped with a launchsensor that picks up a signal when a missile fires its initial boosters, aswell as a tracking sensor that follows the infrared signature of the missilethrough its flight. ?It is seen as the precursor to a full-onoperational system," Northrop Grumman spokesman Bob Bishop told SPACE.com. "It is a demonstration program for space based acquisition and tracking.? In a June 16 test, the STSS satellites monitored thelaunch of an Intercontinental Ballistic Missile (ICBM) by the U.S. Air Force. The Air Force's ICBMMinuteman Missile traveled about 4,800 miles in roughly 30 minutes beforeit hit a target near Kwajalein Atoll in the western chain of the MarshallIslands. The STSS flawlessly detected and tracked the missile during that trip,Northrop Grumman officials said. "Another reliable performance by the STSSDemonstration program satellites is an encouraging development for the nation'smissile defense system," said Gabe Watson, vice president of missiledefense and missile warning programs for Northrop Grumman's Aerospace Systems office. "The capability demonstrated by these space-based sensors is a strongindication of the value this system brings to missile defense." 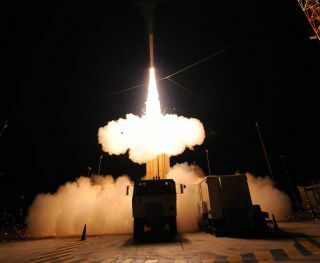 An earlier June 6 test also saw the defense satellitesdetecting and tracking an interceptor rocket launched by the U.S. MissileDefense Agency. The STSS satellites tracked the journey of a two-stageGround-Based Interceptor and relayed data down to ground stations. Overall, the three tests represented progressively morerealistic challenges for the STSS satellites. The two satellites observe a missile at different angles,with one glimpsing the vehicle against the backdrop of the Earth, and the otherobserving the missile with space in the background. Combining those two viewsincreases the STSS satellites' accuracy, Bishop said.